I’ve never been very good at the whole New Year’s reflection and resolution-making routine. I’m more of a cycles person. I prefer marking time by watching the seasons come and go, and enjoying the uniqueness, and the familiarity, of each. This is the start of my third winter in Jax, and I’m getting the hang of what to expect. 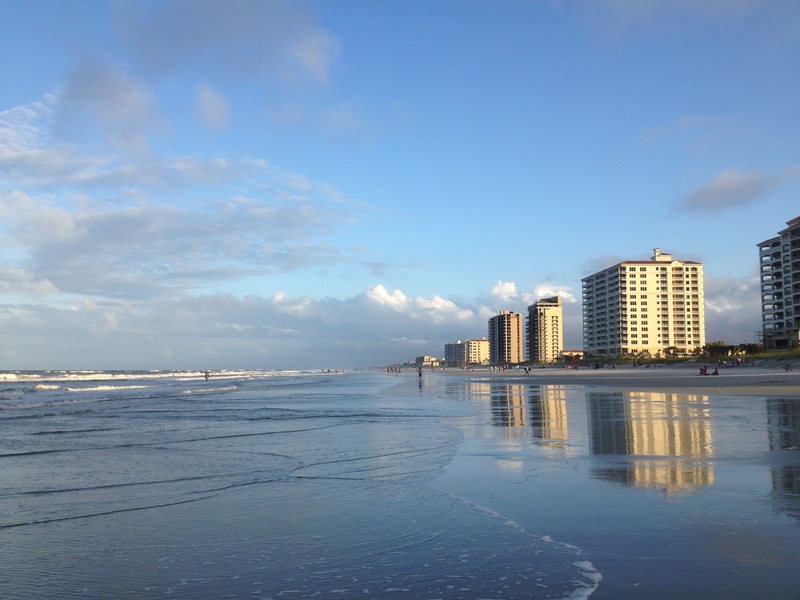 Winter in Jax is cool enough to empty the beaches of swimmers and sun worshipers most days, leaving plenty of room for walkers, runners, cyclists, fishermen, kite-fliers, treasure hunters swinging metal detectors hoping to find something wonderful hidden in the sand, and sea birds. Large flocks gather on the beach during the winter months, most of them a mix of two or three types of gulls and terns, sandpipers and willets. Winter also means groups of Black Skimmers will gather along the shore. Their dark feathers and bright orange beaks jump out in contrast to the whites, greys, and browns of most of the shore birds, sand, sea foam, and cold weather surf. This is the only time of year when the black skimmers are local and they don’t stay more than a couple of months before moving on. But while they’re here, they add a bit of interest to my shoreline walks. More skittish of humans than our year round birds, the black skimmers tend to stay bunched together and when disturbed they usually fly off and land again as a group. During one of my walks last year a flock repeatedly flew beautiful black and orange arcs out over the water each time I got close. I’m looking forward to their return later this month, just as I anticipate the flowers dotting the dunes in spring, the summer heat that restricts my walks to early or late and prompts beach goers to set up rainbow and gem colored umbrellas, and the fall nor’easters that rough up the surf and send ashore all kinds of things previously claimed by the sea. These patterns and routines free my mind so that I can create and build worlds with words. The occasional splash of color, wheel and swoop, beds of shells and sea glass, or stray beached baby shark, remind me to notice the different and unique among the known and familiar. I need both, in the right balance, to inspire my best writing. My business writing happens year round, of course, on the client’s timetable. But my personal writing tends to be a bit seasonal. In the winter I mostly revise, refresh, and plan new projects that I’ll tackle in the spring and hopefully complete by late fall. By the time the skimmers arrive I’ll have already settled into my winter beach routine and the windy, chilly days when I walk more briskly and with my hood up will be commonplace. Wonderfully familiar but customary, until I see that first black skimmer. Then my imagination will fly. It happened again last week. Someone said I was lucky to live near the beach. It’s a maddeningly common phrase. You’re so lucky to…have thick, curly hair…be tall…be athletic…be talented/artistic/creative…win the lottery. Some of those do involve luck. Games of chance. Genetics. But most of what we achieve or have in life owes nothing to happenstance. We worked for it. We sacrificed. We failed. We tried, tried again. We (wo)manned up. We planned. Practiced. Persevered. We didn’t leave anything to chance. Our language is filled with platitudes and clichés about luck vs. achievement through struggle, courage, and will because it is a central question of being human. But don’t worry, I have no plans to answer it here. Probably couldn’t even if I wanted to. I’ll stick to something I know, which is that luck wasn’t involved with my proximity to sand and surf. I live near the beach by choice, courage, determination, and sacrifice. I wasn’t born here. I wasn’t offered a dream job with paid relocation. I didn’t win the lottery. Don’t wait for your beach to find you. 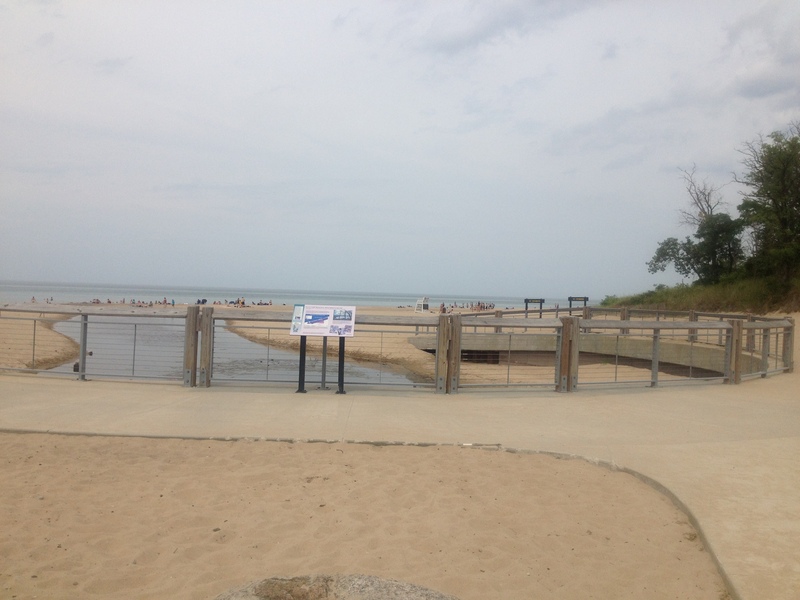 Recently I visited a close friend who found her beach in the middle of the country, along Lake Michigan. We have proclaimed ourselves sand sisters and our personal Facebook pages often feature dueling photos of sand, sunsets, and seagulls. Another thing we have in common is that luck didn’t have anything to do with her relocation either. And it doesn’t have anything to do with creativity. Writers, poets, sculptors, painters, photographers, dancers, singers, musicians, designers, architects, engineers, and anyone else who uses inspiration and imagination to make something from the same raw ingredients that others pass by aren’t creative because they are lucky. They work. They practice. They fail. They try again. You can too. All it takes is realizing that luck has nothing to do with it. At first I thought it was dead. Maybe it was something discarded by a fisherman. Maybe it was half eaten by gulls with just the good side tuned my way. I couldn’t tell. I was still too far away to see detail beyond a vague fish shape carried in by a larger wave and deposited on the sand as the water receded. A few steps closer and it was clearly a full fish. Then it was clearly a little more than a foot long, smooth, and gray, with eyes on the outer edges of a flat, curved head. I was staring down at a baby shovelhead shark. As soon as I saw what it was, I did what I always do when I see something new (or newly dead) on the beach. I took a photo. I don’t know if it was the shutter sound or my presence but something caused the shark to move. 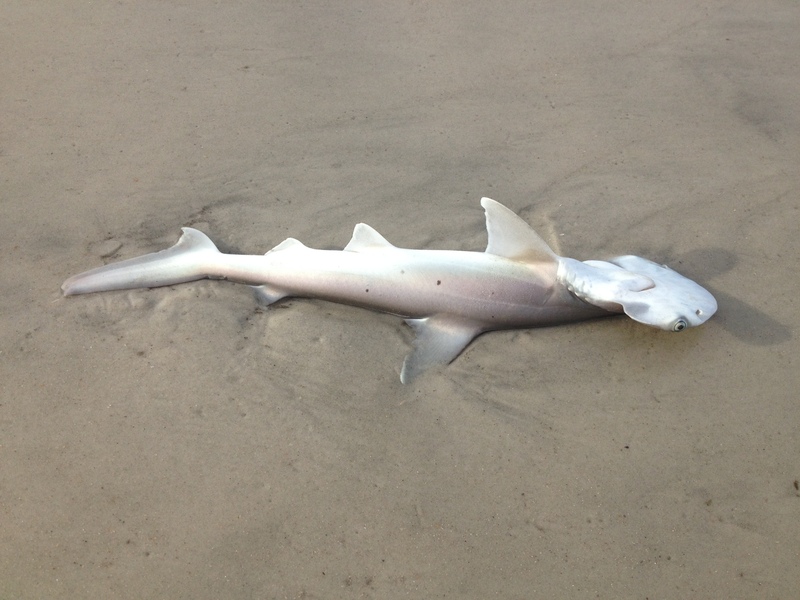 No longer a limp carcass on the sand, the shark lifted his head and twisted toward me, just as I took a second pic. What happened next was a series of hilariously uncharacteristic actions on my part that slurred together into a surrealistic event that I would sum up in five short words when my husband walked up to me several minutes later. First, I should explain that it’s not unusual for members of our family to rescue creatures of all sizes and habitats that find themselves lost, in need, or otherwise distressed. Our first family pet was a malnourished shelter rescue kitten. There was that summer when my husband and son managed to keep our front yard mowed while simultaneously protecting a nest of baby rabbits. And our daughter has repatriated many a stray praying mantis, butterfly, lady bug or beetle that found its way into houses or pools over the years. Since we relocated to the Sunshine state, frogs, toads, and lizards have been added to the list of hoppers and crawlers that we’ve scooped up and released back into the wild. At the beach we’ve returned more than a few stranded starfish to the sea, and this spring my daughter plucked a crab from a boxed in corner and helped him find the sand again. This is what we do. Usually, however, it’s my husband, daughter, or son that does the actual scooping, plucking, grabbing, and releasing, not because I am squeamish but because I am slow. I’m either late to the party altogether, or wasting time assessing the situation while someone else swoops in and takes action. 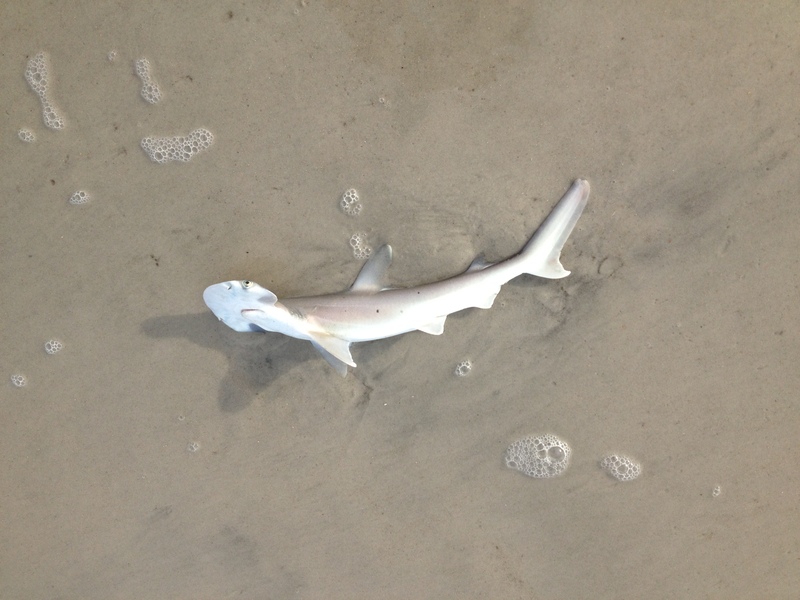 But when the baby shark lifted its head, alerting me to the fact that it was alive, I was the only one around. Hanna Beach was empty for at least half a mile south–the direction I’d just walked from–and a glance north revealed my husband was still well out of shouting range. I was on my own. Balancing my iPhone in one hand with a sand dollar I’d liberated from the shore earlier in my walk, I reached down, gently rolled the shark onto its belly, and grabbed him right behind the first dorsal fin. As I picked him up he swung his head side to side, trying to wiggle free of my grasp. Apparently he didn’t think being up in the air was an improvement on writhing in the sand. By this point, however, I was determined to put him back where he belonged, so I tightened my grip and followed that with the most logical next step. I spoke full sentences out loud to a baby shovelhead shark. It worked. Or he’d been out of the ocean way too long. Or both. Whatever the truth of it was he remained still for the rest of our journey. I waded knee-deep so that he wouldn’t immediately be washed back ashore, placed him in the sea, and let go. At first nothing happened. Then he listed to his left side and I thought I was too late. But suddenly his tail flipped sideways, he righted himself, and he swam back and forth in front of me a couple of times. Instinctively, I stuck my hand back in the water behind his tail and made that shooing motion all Moms make to encourage slow children, dogs, cats, goats, toads, or anything else that needs to pick up their pace. Baby shovelhead shark took off, his fin breaking the surface briefly past the next wave before he disappeared into the Atlantic. After wading back out of the surf I watched the coastline until my husband caught up to me and we both felt sure the shark was safely out to sea. The remarkable thing about that experience was how unremarkable it was. Sure, that was the first and only time I’ve carried a shark (of any kind or size) back out to sea, but it wasn’t the only interesting thing about that day’s walk, or any of the other hundreds of walks I’ve taken on these northeastern Florida beaches. Also on that walk, I found the sand dollar I mentioned earlier, and had a delightful conversation with a young woman and her preschool daughter about the creature that lived in a whelk shell that they’d found and her mother had to eventually bury back in the sand so her daughter would leave it alone. 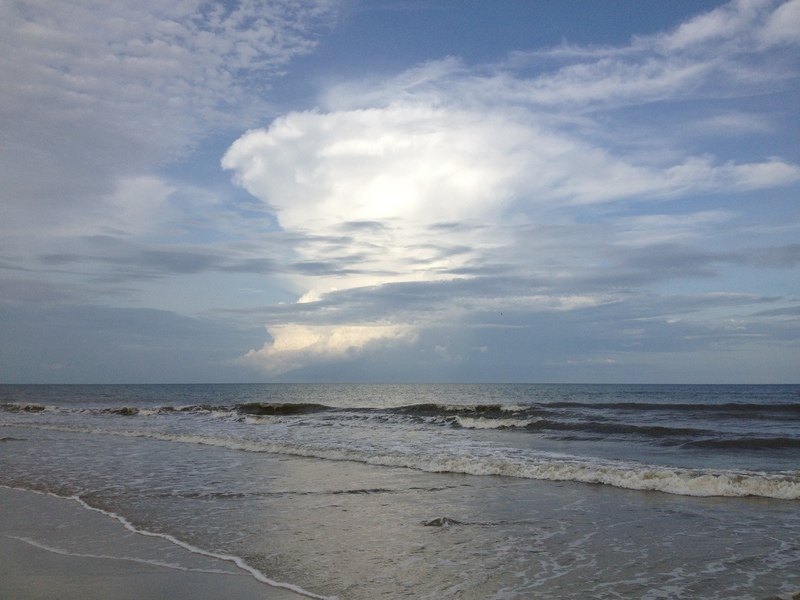 Routinely we watch dolphins play out past the sand bars and osprey and pelicans hunting along the shore. We hear gulls squabble, at each other and sometimes at us. We’ve seen manta rays almost close enough to touch. 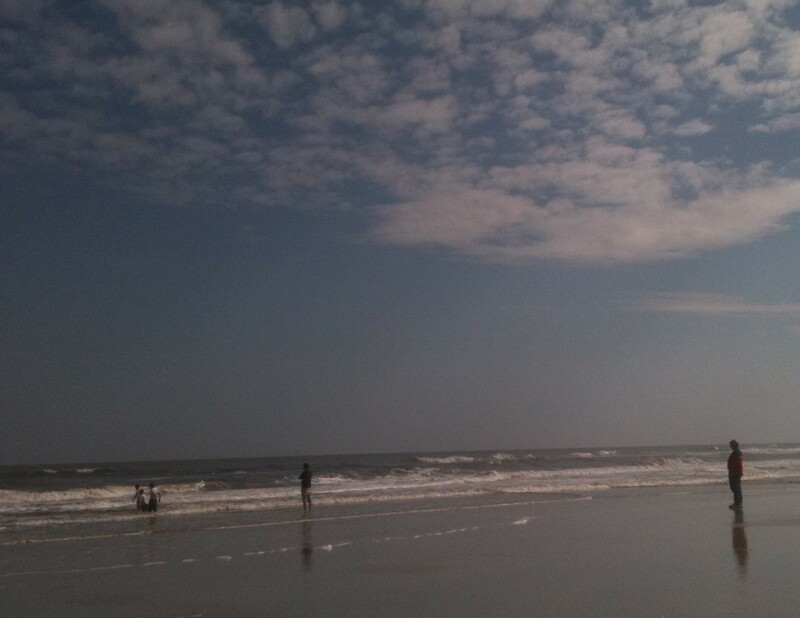 We’ve had interesting and sometimes outright bizarre conversations with fishermen, walkers, and shark tooth hunters from all over the country and just down the road, including a man who’d cycled to Jax Beach from LA. It’s not unusual for something unusual to happen on our walks. It’s weird if a walk is routine. I don’t know if interesting and offbeat encounters happen to our family because we are creative people, or if we, as writers, poets, dancers, and artists, bring our altered perspective to otherwise mundane situations and make them more than they might be on their own. But I like to think that these experiences are there for all to have, if they make time to fully interact with the world around us. What I’m sure of, though, is that these experiences are critical for creative people to have if they want to continue building worlds from words, paint, motion, pixels, or clay. Before you can write what you know, you have to know. And more often than not, knowing comes from doing. Living. Experiencing. Make it an everyday thing. Edited to add link to First Friday Link Party for Writers. I get grumpy about the annual switch to Daylight Savings Time. Every spring we change the clocks and the daylight that has been increasing each morning since the Winter Solstice suddenly disappears again, moved instead to the end of the day. It feels like just as we were making progress toward those long summer days that begin early and stay late, somebody hit rewind and we have to replay the last month. The upside, of course, is that our evenings have suddenly expanded, jumping ahead of the trend that Mother Nature was already setting, providing extra daylight for those evening beach walks I’ve been missing since the days got short last fall. You might think that would counter my grumpiness at losing an hour last weekend. But no. I will remain grumpy about that for at least a week, as a matter of principle. What does counter grumpiness, and just about anything else I ever need countered, is a walk along one of our local beaches or the sudden arrival of Spring weather. Yesterday featured both! 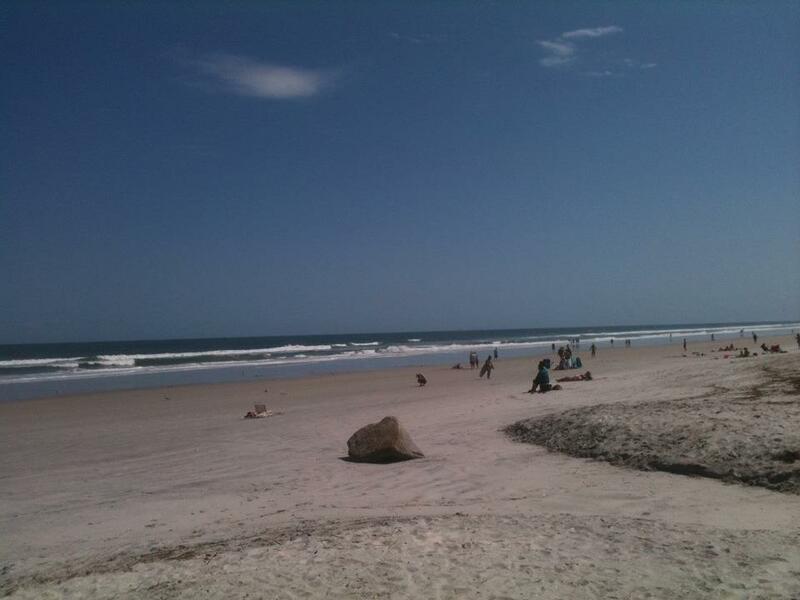 As late as last Friday the beach looked and felt rather winter-like, or at least Northern Florida winter-like. Last Friday offered an abundance of sunshine and blue sky, but highs were struggling to find the 60s, hampered by a fierce wind out of the north. Still, as my feet reached the sand I saw a hint that Spring was imminent. 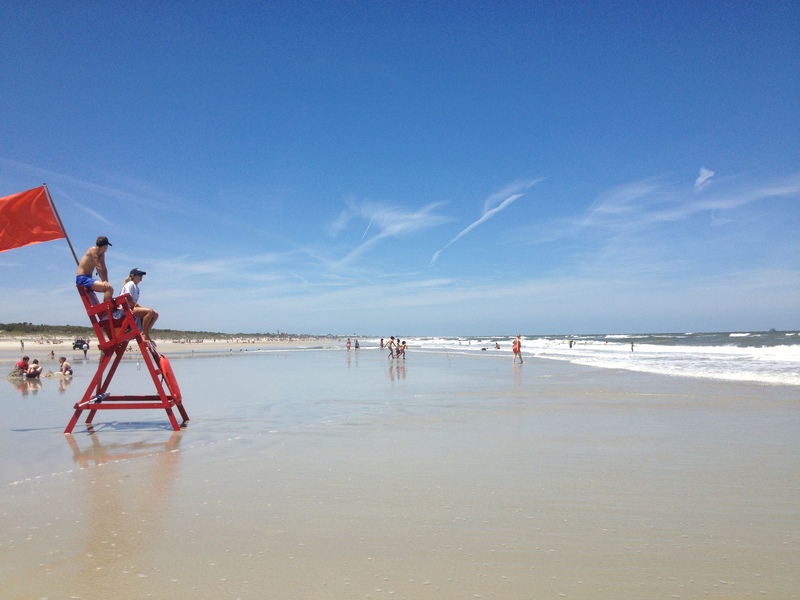 Those familiar, red-orange lifeguard towers were back on Jax Beach. Uninhabited towers kept watch over a largely empty surf and barren beach, but the fact that they were out of storage promised change. 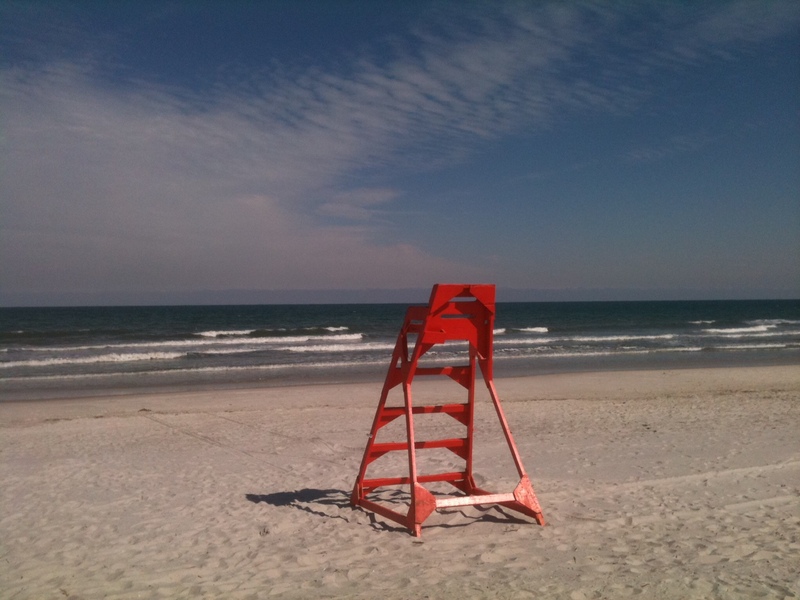 Two days later those towers contained lifeguards, the waves entertained surfers, and the sand soothed families and couples eager to soak in the sun without needing a jacket. Goodbye, grumpiness. Hello, Spring! If Spring hasn’t reached your particular shore, here’s a peek at ours to tide you over. Over the last year and a half, I’ve learned how to walk along the beach without disturbing the gulls that gather in bunches up and down the coast. At first they flew whenever I got near them, but after awhile I discovered that if I approach quietly at a steady pace, and avoid making eye contact, most of the gulls (Ring Billed, Common, Laughing, or Herring) tend to walk toward or away from the water just enough to clear a path for me through the middle of the flock. They might complain. The Laughing Gulls almost always do! But only the most skittish gulls take flight, frequently joined by the terns, and they usually fly only a few feet before dropping back down into the sand as I pass them by. Black Skimmers are a different story. They visit our beach only a few months each winter and they fly as soon as I get anywhere near them, permitting me to accumulate numerous blurry photos that feature their tail feathers. Last Friday as I walked north along the shore I repeatedly approached a flock of Black Skimmers. Before that day, I hadn’t seen more than four or five together, but this time over two dozen were gathered at the water’s edge. When I came within 10 feet of them they took flight as a group, first out over the water and then arcing back to the sand a little farther up the shore. When I caught up to them again, they took flight once more out over the surf and back to the sand a little farther ahead. This pattern was repeated a couple more times until the Black Skimmers dropped back into the sand with a similar size group of Sanderlings and a handful of Laughing Gulls. As I approached this mixed flock, the Laughing Gulls squawked a bit and sidestepped into the water, the Sanderlings chattered and trotted farther inland, and the Black Skimmers once again took flight all together but this time they flew the opposite direction. 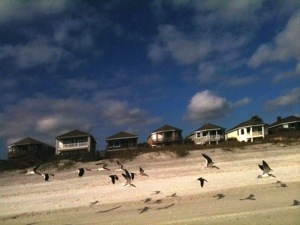 Once out over the surf, the Skimmers turned south and flew behind me. For a moment I thought they’d figured out that I wouldn’t disturb them any more if they let me get past them and then dropped back down with the gulls and the Sanderlings. But that wasn’t their plan. Instead they circled behind me on the right, flew up alongside me on the left, and then on up ahead, landing beside the water once more about 20 yards in front of me. We resumed our previous pattern with the Skimmers flying on down the coast each time I approached and remaining just out of reach, until I arrived at the walkover where my car was parked and left the beach. As I got into the car and headed home I wondered how many times we would need to do that same dance before the Skimmers got used to me like the gulls and terns have, and simply moved off to one side, complaining, as I passed by. Creativity frequently eludes me much like those Black Skimmers. I’ll catch a glimpse of a new idea, a fresh connection, but as I approach it takes flight, wheeling out over the ocean of thoughts in my head, and sometimes circling back around me before landing just out of reach. I have to be careful not to make any sudden moves, loud noises, or eye contact, until the new idea and I have had a chance to feel each other out a bit, grow accustomed to each other, and convince ourselves that neither poses a threat. Only then can I get a good look, and maybe even snap a photo or two. Jax Beach winter days separate the tourists from the locals. Tourists enter the water without a wet suit. Locals do not. On a warm winter day a couple of weeks ago, when the temps were high enough that the locals were only wearing light jackets during their beach visits, I watched an older man, his son, and his grandsons near the surf. The grandfather was a local, dressed in jeans, jacket, and hat, and wearing shoes. He stood a few feet back from where the water met the sand, smiling as he watched the others. 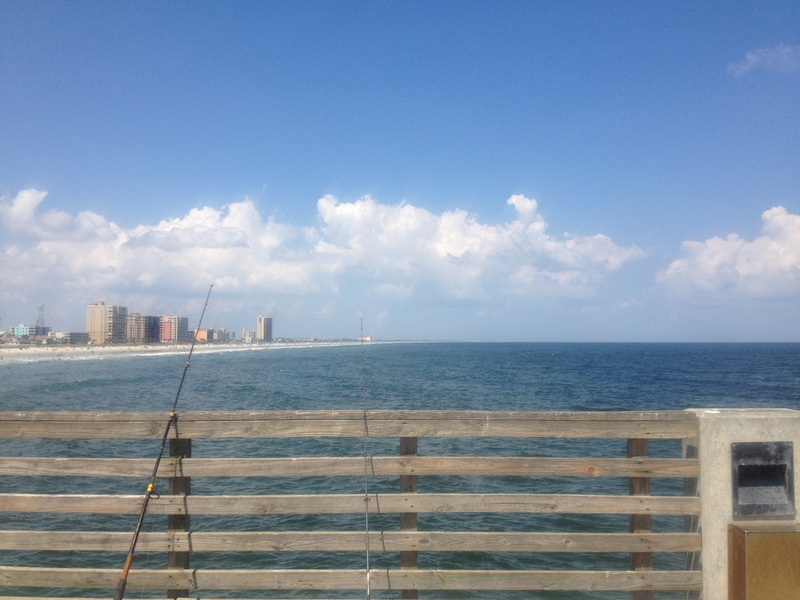 The son, barefoot with long shorts and a shirt but no jacket, was standing ankle-deep. He appeared to be straddling the line between comfortable and pained, looking back at the grandfather occasionally but mostly keeping his gaze focused on his sons. The grandsons were nearly waist deep in the surf, jumping each time a wave crashed into them, apparently unfazed by the temperature of the water or the air. They were wearing jeans/shorts and t-shirts, all quite wet. “Tourists,” my husband said, shaking his head and smiling. As we left the beach, grandpa, son, and grandsons, remained three generations of coastal interaction, from all in to just getting feet wet to opting for observation from dry land. 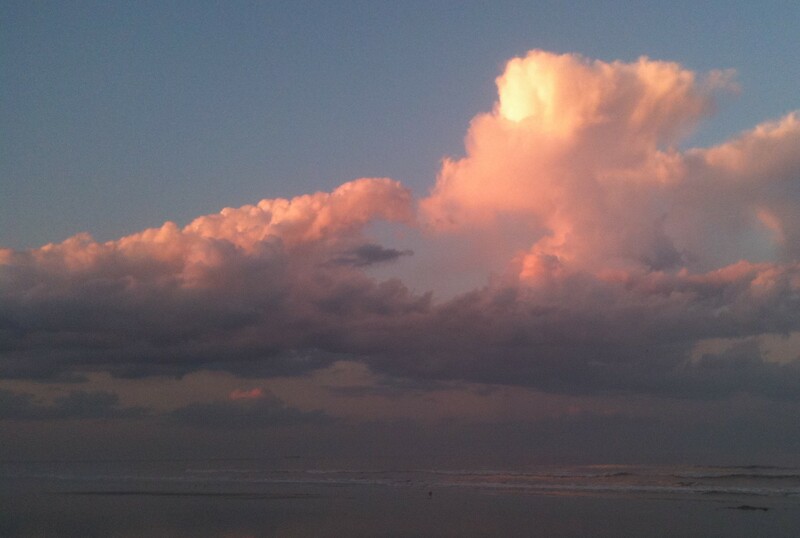 In this regard the coast has an awful lot in common with creativity, art, and writing. Some watch and enjoy the view, some dabble in the shallows along the edge, and some dive right in. Each has their place and purpose.